Much like Fitbit or Nike+, Striiv's Pedometer provides in-depth metrics for your daily activity, but Striiv's killer feature is its apps; you can take on your buddies in races, see how far you've walked up a virtual Mount Everest, or raise money for charity. Gizmodo readers can get Striiv for 40% off. Unless you're Usain Bolt, the physical action of putting one leg in front of the other lacks excitement. 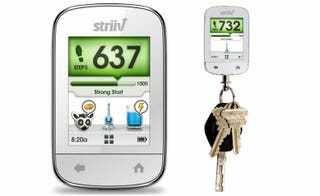 Striiv's Smart Pedometer provides the motivation we all need by adapting to our activity and setting realistic challenges. Smart Personalization — personal challenges are created based on your level of activity, and the more you walk, the more Striiv adapts to your behavior. Challenges + Achievements — earn trophies for real-life achievements like burning off a cupcake or "climbing" Mount Everest. Walk For Charity — Striiv and corporate partners donate on your behalf. Just walk, earn, and plug in to your PC to donate. Gaming — in Myland, everything you build on your enchanted island is based on how much you walk. Or, if you fancy some multiplayer action, you can race "across" the Golden Gate Bridge or "up" the Statue of Liberty in real-time. Analytics — Striiv offers weekly and monthly charts of your steps, stairs, distance, calories and minutes of activity right on the device. Plus, access your stats on Striiv.com (see below).